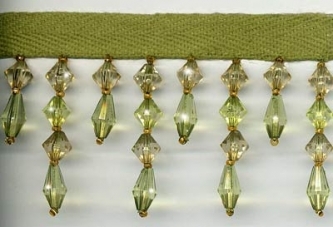 From our California Style Collection: "The Valley " California Style Collection is an exquisite beaded fringe trim in pale sage green and a slightly brighter sage green crystal clear beads with seed beads in sparkling gold. The California Style Collection is an understated yet "so perfectly beautiful" trim that we are delighted to add it to our Collections. 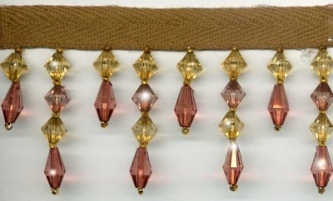 This is a high quality, very full beaded fringe with exceptional detail and craftsmanship. This style tassel fringe is 2 inches long, which includes the 3/8 inch sage green cloth binding at the top. 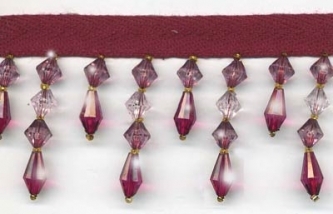 From our California Style Collection: "Los Angeles " California Style Collection is an exquisite beaded fringe trim in 3 shades of rose (a dark burgundy, a paler burgundy and a very pale pink) and with seed beads in sparkling gold. "Los Angeles" is rich and beautiful, just like LA! 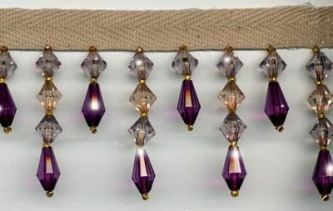 This is a high quality, very full beaded fringe with exceptional detail and craftsmanship. 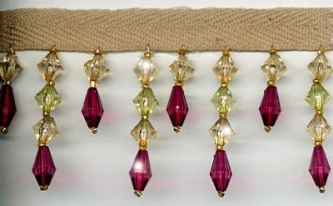 This style tassel fringe is 2 inches long, which includes the 3/8 inch burgundy cloth binding at the top.